New DVD Player+ App (with Update) - DVD Player+ (FREE) - M.I.L. Team - 3D+ and more..
... more than a player ..
Great News here at Mobility in Life Applications! We are happy to announce our new powerful DVD Player Application now comes with a great update. The new version (named: version 3.0) comes to update the previous one (2.0). Read a quick memo about the new features we have added to the app (we are sure you will love them) and install the application on your Windows 10 device! ​(or update to the latest version if you already have the 2.0 version). The new version allows you to play directly almost any Movie from DVD's, VCD's or Audio-CD's. Many users have asked for this valuable feature, so here you go. Enjoy your favorite DVD Movie directly from inside the app. Apart from the Movie Player, we have also added a new and Innovative way to enjoy your DVD Movies. 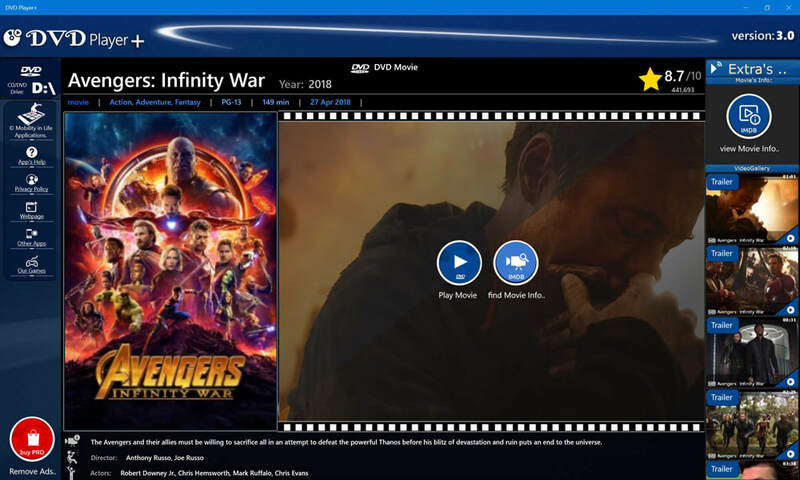 Thus, for each DVD movie, you are autoprovided with all the available information about the Movie you have selected to watch (the Plot, the Movie Poster, access to all the official Trailer and Videos), etc. The experience is enriched with all these features. For this to work, you don't have to do anything from your part. Just put the DVD Disc with the Movie in your optical drive. The app will autorecognize the movie and you will provided with all the Extra Info for it! In addition, in our new Movie Player, there is the ability to select and switch On/Off the DVD subtitles, switch the Audio language of the movie, Navigate througth the Chapters, etc. There is also the option to add subtitles from an external file on your PC. Plus, if you find that your subtitle file is out-of-sync with the movie, you are able to sync the two (movie and subtitle)! [ 4 of 4 ] OPTION TO REMOVE ADS FOREVER ! We have also added the option to disable any ads inside the app, by purchasing an addon. This is happened once and you will not see anymore ad, forever. But, if you don't want to pay anything, this is not a problem. All features of the app are free to use and no extra ads will be shown during the movie playback! So, what do you wait for? Click on the button below to update the app now to the latest version and enjoy! What to do you plan to do?